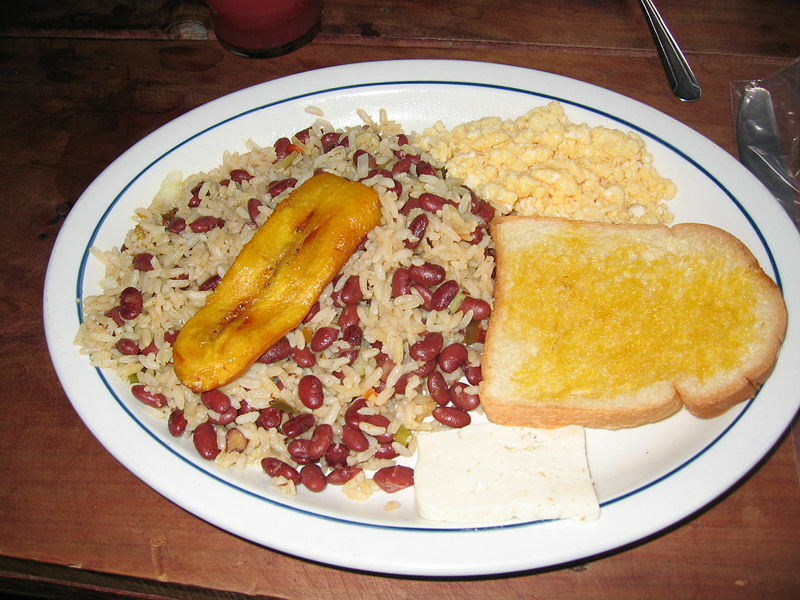 Gallo pinto (or gallopinto) is the prototypical traditional dish of Costa Rican and Nicaraguan cuisine. It is considered the national dish, and is eaten as a part of any meal. 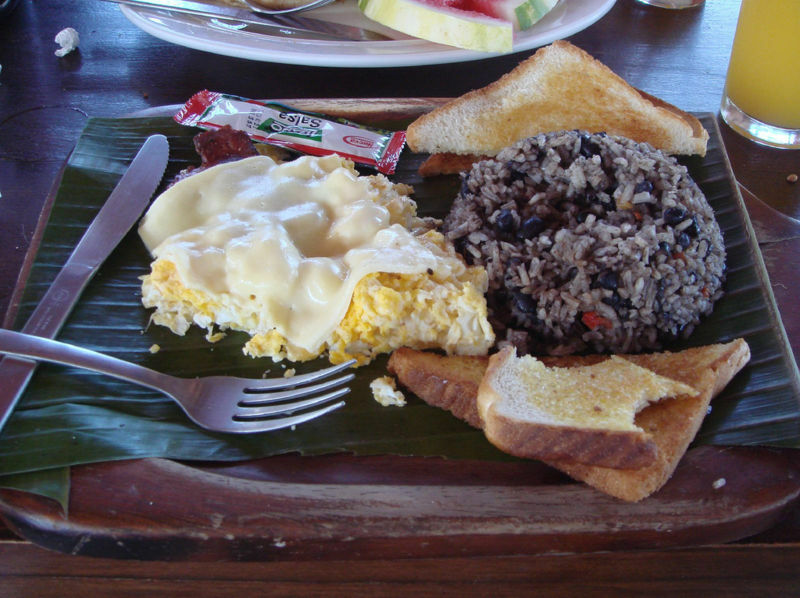 Left: A Costa Rican breakfast with gallo pinto (right). Though many variations exist, the dish at its most basic is composed of pre-cooked rice and beans fried together with spices such as cilantro, onion and peppers. When the beans and rice are combined, the rice gets colored by the beans, and the mix results in a multi-colored, or specked appearance. Costa Ricans usually use black beans while Nicaraguans use small red beans. Beans are slowly cooked until the juice is almost consumed. Gallo pinto means 'mottled rooster' in Spanish, thus the name fits with the colored rice. The dish has several variations including the addition of grated coconut and coconut milk. In Costa Rica it is commonly served with Salsa Lizano. Left: A Costa Rican Breakfast; rice and beans with eggs, toast, fried banana, and a slice of white cheese. There are other variations of this dish. One of them is known as Moros y Cristianos ("Moors and Christians") in Spain and Cuba, but regarding the true nature of gallo pinto, it is believed that it came to be known through the Afro-Latino immigrants who live on the Caribbean coasts. They simply call it "rice and beans" and prepare it with coconut oil and/or shredded coconut. A similar dish is found in Panama, and in El Salvador where it is called casamiento. Other national variations include Dominican Republic and Puerto Rico (a variation with pigeon peas); Colombia (calentado paisa) and even Peru (tacu tacu).